Get active and complete a marathon at your own pace! Cover 42.2 kilometres between 4 May and 18 May 2019 and help make a difference for Breast Cancer patients! Whether you’re a daily walker, regular short distance runner or marathon champion, the Yarra’s Edge Progressive Marathon is the perfect way to get active, fit and healthy this May while raising money for the Think Pink Living Centre and its support services. Open to people of all fitness levels, participants are invited to complete the 42.2km marathon distance at their own pace over a two-week period. Track your distance by joining our Yarra’s Edge Progressive Marathon Strava group and complete the distance between 4 May and 18 May 2019. You can walk 3kms a day or jog 21kms over two days – how you get to the finish line is completely up to you! Celebrate all things wellness with healthy treats and fun activities, all while enjoying a morning by the waterfront. Whether you are a participant or spectator, we’d love you to join us. 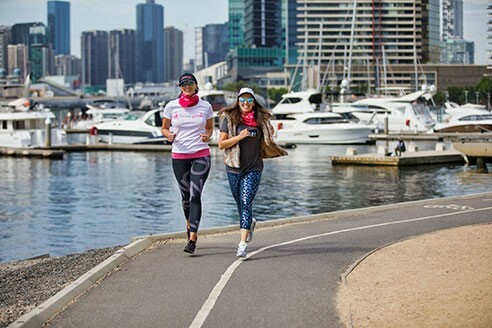 Think Pink Ambassadors (above): Karen Hitchings and Fem Belling in training for the Yarra’s Edge Progressive Marathon at Docklands.